Objective To evaluate the changes in transvalvular gradients and the incidence of valve haemodynamic deterioration (VHD) following transcatheter aortic valve replacement (TAVR), according to use of anticoagulation therapy. Methods and results This multicentre study included 2466 patients (46% men; mean age 81±7 years) who underwent TAVR with echocardiography performed at 12-month follow-up. Anticoagulation therapy was used in 707 patients (28.7%) following TAVR (AC group). A total of 663 patients received vitamin K antagonists, and 44 patients received direct oral anticoagulants. A propensity score matching analysis was performed to adjust for intergroup (AC vs non-AC post-TAVR) differences. A total of 622 patients per group were included in the propensity-matched analysis. VHD was defined as a ≥10 mm Hg increase in the mean transprosthetic gradient at follow-up (vs hospital discharge). The mean clinical follow-up was 29±18 months. The mean transvalvular gradient significantly increased at follow-up in the non-AC group within the global cohort (P=0.003), whereas it remained stable over time in the AC group (P=0.323). The incidence of VHD was significantly lower in the AC group (0.6%) compared with the non-AC group (3.7%, P<0.001), and these significant differences remained within the propensity-matched populations (0.6% vs 3.9% in the AC and non-AC groups, respectively, P<0.001). The occurrence of VHD did not associate with an increased risk of all-cause death (P=0.468), cardiovascular death (P=0.539) or stroke (P=0.170) at follow-up. Conclusions The lack of anticoagulation therapy post-TAVR was associated with significant increments in transvalvular gradients and a greater risk of VHD. VHD was subclinical in most cases and did not associate with major adverse clinical events. Future randomised trials are needed to determine if systematic anticoagulation therapy post-TAVR would reduce the incidence of VHD. Transcatheter aortic valve replacement (TAVR) is well established for treating severe symptomatic aortic stenosis in patients who are not candidates for surgical aortic valve replacement (SAVR), and in those deemed to be at high surgical risk.1 2 The results of large multicentre registries and prospective randomised trials3 4 have provided evidence supporting the use of TAVR as an alternative to SAVR in intermediate-risk patients. Given this emerging trend to treat lower-risk and younger patients with transcatheter heart valve (THV) platforms, identifying factors posing an increased risk for THV deterioration is of utmost clinical relevance. Although structural valve degeneration requiring valve replacement seldom occurs early post-TAVR, the incidence of subclinical haemodynamic valve deterioration (VHD) during the year following TAVR is around 3%–4% according to recent studies5 (personal communication Vemulapalli et al, Incidence and Outcomes of Valve Hemodynamic Deterioration in Transcatheter Aortic Valve Replacement in U.S. Clinical Practice: A Report from the Society of Thoracic Surgery/American College of Cardiology Transcatheter Valve Therapy Registry ACC 2016). Also, concerns have recently emerged regarding subclinical valve thrombosis post-TAVR, with rapidly increasing transvalvular gradients likely signifying the advent of valve thrombosis despite the absence of clinical symptoms.6–8 Moreover, several studies have suggested that the incidence of early subclinical bioprosthetic valve thrombosis leading to reduced aortic valve leaflet motion, as determined by four-dimensional CT, may be higher than expected.9 10 In light of these findings, and given that antithrombotic regimens post-TAVR remain to be established, our aim was to determine the incidence and clinical consequences of VHD post-TAVR, according to the presence or not of anticoagulation therapy post-TAVR. Transthoracic echocardiography (TTE) examinations were performed at baseline, on hospital discharge and at 12 months post-TAVR. TTE examinations were conducted according to American Society of Echocardiography guidelines.12 13 Peak transprosthetic flow velocity was determined by continuous-wave Doppler imaging. The mean transprosthetic gradient was calculated using the modified Bernoulli formula; for patients in AF, at least five consecutive beats were averaged. Absolute change in mean gradient was calculated as the gradient at follow-up minus the gradient at discharge. VHD was defined as an absolute increase in gradient of ≥10 mm Hg during follow-up14 15 (Vemulapalli, ACC 2016). Categorical variables are reported as n (%). Continuous variables are expressed as mean±SD or median (25th to 75th IQR) depending on variable distribution. Group comparisons were analysed using the Student’s t-test or Wilcoxon rank-sum test for continuous variables, and χ2 test for categorical variables. A propensity score matching analysis, using a one-to-one Greedy 6→1 digit-matching algorithm without replacement was performed to adjust intergroup (anticoagulation (AC group) vs no anticoagulation (non-AC group) at discharge) differences in baseline characteristics caused by the selection bias inherent to the non-randomised nature of the study. Patients were matched in 1:1 ratio. First, matches were made within a calliper width of 0.000001 (‘best matches’), then calliper width increases incrementally for unmatched cases up to 0.1. Variables used in the propensity-matched algorithm were those that showed a P value <0.2 at baseline and procedural characteristics. Selected variables were age, previous coronary artery disease, chronic obstructive pulmonary disease, mean gradient (baseline), left ventricular ejection fraction (LVEF) at baseline, prosthesis size, approach and valve type, using a logistic regression analysis (online supplementary table 1). Patients with changes in anticoagulation therapy before 1-year echocardiogram were excluded from the propensity-matched analysis. Absolute standardised differences were estimated for all baseline covariates before and after matching to assess prematch and postmatch imbalances. Absolute standardised differences <10% for a given covariate indicate a relatively small imbalance. Changes in mean transvalvular gradient over time were evaluated with repeated-measures analyses of variance. Analyses were conducted on log-transformed data to adjust for its skewed distribution. Posteriori comparisons were performed using the Tukey’s method. The normality assumption of variables was verified with the Shapiro-Wilk tests on the error distribution form the Cholesky factorisation of the statistical model. The analysis of variance test was used for comparing the changes in transvalvular gradient over time between groups. All analyses were performed using a hierarchical method in order to account for between-centre variability. Mortality and stroke rates were presented using Kaplan-Meier estimates and comparisons between groups were performed with the log-rank test or the Wilcoxon test for the propensity-matched cohort. All analyses were conducted using the statistical package SAS V.9.3 (SAS Institute). The main baseline and procedural characteristics of the study population, according to the use of anticoagulation therapy at hospital discharge, are shown in table 1. Patients receiving anticoagulation therapy post-TAVR (n=707, 28.7%) were older (P=0.004), less likely to harbour concurrent significant coronary artery disease (P=0.002), had a lower transaortic gradient pre-TAVI (P<0.001) and tended to receive a balloon-expandable THV (P=0.108) via a transfemoral approach (P<0.001). The reasons for receiving anticoagulation therapy were atrial fibrillation in 573 patients (81%) and other causes in 135 patients (19%). A total of 663 patients received vitamin K antagonists (VKA) and 44 patients received direct oral anticoagulants (DOAC). A change in anticoagulation treatment occurred in 38 patients within the first year following TAVR (anticoagulation treatment was stopped in 18 patients, and 20 patients without anticoagulation therapy at hospital discharge received some type of anticoagulation therapy, mainly due to the occurrence of new-onset atrial fibrillation). There was a small although significant difference between groups in mean transvalvular gradients on hospital discharge (AC group: 9.4±4.5 mm Hg, non-AC group: 9.8±4.6 mm Hg, P=0.04). At 1-year follow-up, there was a significant increase in mean gradient in the non-AC group (online supplementary figure 1), mean transprosthetic gradients were 9.1±4.2 mm Hg in the AC group (P=0.323 vs discharge) and 10.3±5.3 mm Hg in the non-AC group (P=0.003 vs discharge; P<0.02 for differences between groups). The incidence of VHD at 1-year follow-up was lower in the AC group (0.6%) compared with the non-AC group (3.7%, P<0.001 for differences between groups) (online supplementary figure 2). There were no differences in the incidence of VHD according to different generations of transcatheter valves (Cribier-Edwards/SAPIEN/SAPIEN XT vs SAPIEN 3, P=0.76; CoreValve vs Evolut R, P=0.19). Among those patients meeting the criteria for VHD, 47 patients (69%) had a mean transvalvular gradient ≥20 mm Hg at follow-up, 15 patients (19%) had gradients ≥30 mm Hg and 8 patients (7.5%) had gradients ≥40 mm Hg. Of the 69 patients meeting criteria for VHD at 12-month follow-up, two underwent a second TAVR procedure, and five patients receiving antiplatelet therapy were treated with warfarin. Anticoagulation therapy was associated with a reduction in transvalvular gradients (to postdischarge values) in all patients. No additional measures or antithrombotic treatment changes were undertaken in 62 of the patients with VHD at 1-year follow-up. Of these, echocardiography data at 2-year follow-up was available in 19 patients. No significant progression of mean transprosthetic gradients between 1 and 2 years post-TAVR were noted in these patients (P=0.803) (online supplementary figure 3). The Kaplan-Meier curves at 4-year follow-up according to the diagnosis of VHD are shown in online supplementary figure 4. VHD did not associate with increased death (P=0.468), cardiovascular (CV) death (P=0.539) or stroke (P=0.170) rates at follow-up (table 2). There was no association between changes in mean gradient (considered as a continuous variable) and clinical outcomes in the general cohort: all-cause mortality (HR: 0.99 for each increase of 1 mm Hg in mean gradient, 95% CI (0.97 to 1.01) P=0.305), CV death (HR: 0.99, 95% CI (0.96 to 1.02) P=0.438) or stroke (HR: 0.98, 95% CI (0.93 to 1.03) P=0.352). Similar results were observed in those patients meeting criteria of VHD: all-cause mortality (HR: 0.93 for each increase of 1 mm Hg in mean gradient, 95% CI (0.72 to 1.20) P=0.584), CV death (HR: 0.96, 95% CI (0.62 to 1.05) P=0.876) or stroke (no events). A total of 622 patients receiving anticoagulation therapy post-TAVR were matched using a propensity score matching analysis with 622 patients not receiving anticoagulation therapy. Table 3 shows the baseline and procedural characteristics of the propensity-matched population, according to anticoagulation therapy at hospital discharge. There were no significant between-group differences in baseline and procedural characteristics. The reasons for receiving anticoagulation therapy were atrial fibrillation in 497 patients (80%) and other causes in 125 patients (20%). A total of 587 patients received VKA and 35 patients received DOAC. At 1-year follow-up, there was a small but significant increase in mean transvalvular gradient in the non-AC group (figure 1). The incidence of VHD at 1-year follow-up was lower in the AC group (0.6%) compared with the non-AC group (3.9%, P<0.001 for differences between groups. There were no differences between patients with and without VHD in the rate of global death (P=0.954), CV death (P=0.383) or stroke (P=0.466) at follow-up (figure 2, table 4). 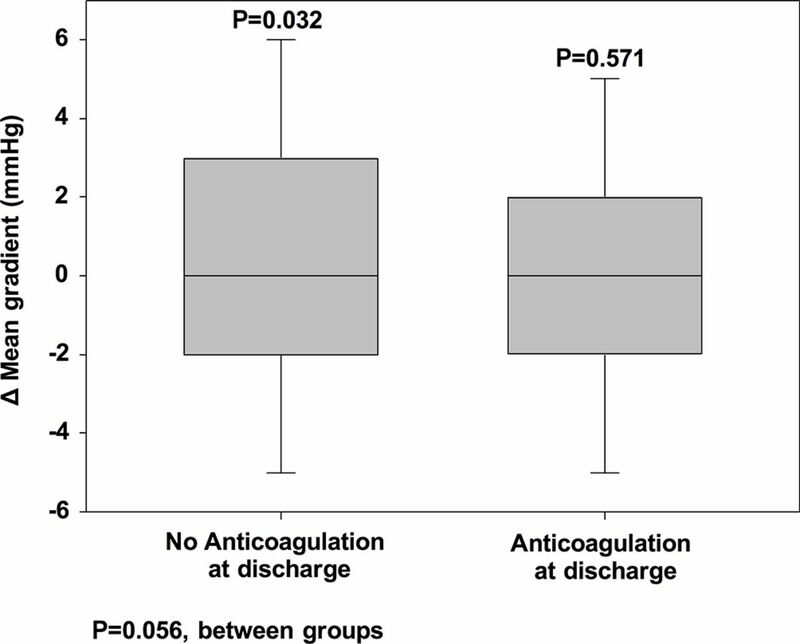 Absolute changes in mean transvalvular gradient between discharge and 1-year follow-up in the propensity-matched population according to the presence of anticoagulation therapy at hospital discharge (analyses conducted on log-transformed data). Kaplan-Meier survival curves following TAVR, according to VHD in the propensity-matched population. (A) Global death. (B) CV death. (C) Stroke. CV, cardiovascular; TAVR, transcatheter aortic valve replacement; VHD, valve haemodynamic deterioration. A subanalysis comparing patients receiving dual antiplatelet therapy versus anticoagulation therapy was performed (online supplementary table 2). Patients receiving anticoagulation therapy post-TAVR were older (P=0.018), less likely to harbour concurrent significant coronary artery disease (P<0.001), had a lower transaortic gradient pre-TAVI (P<0.001) and were more likely to receive a balloon-expandable THV (P<0.001) via a transfemoral approach (P<0.001). The incidence of VHD was higher among patients treated with dual antiplatelet therapy compared with those receiving anticoagulant therapy (3.4% vs 0.6%, P<0.001). The lack of anticoagulation therapy post-TAVR influenced transcatheter valve haemodynamics, and was associated with increased transvalvular gradients and a higher risk of VHD at 1-year follow-up. Our data suggest that valve thrombosis is likely an important mechanism of early VHD post-TAVR. VHD was mild in the majority of cases (only 7.5% of patients diagnosed of VHD had transvalvular gradients ≥40 mm Hg) and did not associate with major adverse clinical events after a mean follow-up period of about 2 years. Also, according to the classification of bioprosthetic valve thrombosis recently proposed by Dangas et al,16 among the 69 patients diagnosed with VHD, 7 and 62 patients would meet the criteria of definitive and probable valve thrombosis, respectively. Mean transprosthetic gradients ranging from 20 to 40 mm Hg have been proposed in VARC-2 to be indicative of mild valve stenosis, whereas mean gradient >40 mm Hg is considered moderate-to-severe THV stenosis post-TAVR.11 However, the use of a fixed cut-off point could lead to an overdiagnosis of acquired THV stenosis in patients with elevated mean transprosthetic gradients at discharge and could underestimate relevant changes in valve haemodynamics over time in those with low mean transprosthetic gradients postprocedure. In patients with established aortic stenosis, an increase in mean gradient >10 mm Hg over time is considered as a significant progression of the stenosis.17 Also, the intraobserver and interobserver variability for the measurement of mean transaortic gradient has been established at <10 mm Hg.18 Thus, and according to prior studies5 14 19 (Vemulapalli, ACC 2016), the absolute increase in mean transprosthetic gradient of ≥10 mm Hg over time was established to define VHD. Bioprosthetic valve thrombosis is an unusual but potentially life-threatening complication after SAVR. The incidence of bioprosthetic valve thrombosis requiring reoperation within the 2 years following SAVR ranges from 0.37% to 1.26%, depending on valve type.20 However, the true incidence of bioprosthetic valve thrombosis may have been underestimated, as the occurrence of mild valve thromboses (usually not requiring reintervention) was not taken into account. Hypercoagulable states, low LVEF and factors leading to abnormal flow patterns such as small valve size, perivalvular leaks and pannus may predispose to valve thrombosis.20 Current guidelines recommend anticoagulation therapy for 90 days after bioprosthetic SAVR.21 22 These recommendations were based on several observational studies that showed a reduced risk of thromboembolic complications in patients receiving warfarin. However, the risk/benefit of anticoagulation therapy after bioprosthetic SAVR remains controversial, and some studies have suggested that only high-risk patients may benefit from VKA23. Clinically relevant bioprosthetic valve thrombosis is such an unusual event that available studies to date were underpowered to determine both the optimal type and duration of antithrombotic therapy post-SAVR. The incidence of clinically relevant valve thrombosis post-TAVR remains uncertain. While some studies have estimated the incidence of symptomatic valve thrombosis post-TAVR at approximately 1%,10 24 only seven patients (0.2%) meeting the criteria of VHD required a specific intervention (either anticoagulation therapy or reintervention) in our study. There is however an increasing concern about subclinical valve thrombosis post-TAVR. Leetmaa et al 25 reported an incidence of 4% of THV thrombosis performing multidetector CT (MDCT) within 1 and 3 months after TAVR. Interestingly, 80% of these patients were asymptomatic and had a normal transthoracic echocardiographic study. In the same direction, Pache et al 26 evaluated 156 patients by MDCT after a median of 5 days post-TAVR with the SAPIEN 3 THV system. Early hypoattenuated leaflet thickening (HALT) was found in about 10% of patients, and it was reversible following oral anticoagulation in all instances. Interestingly, at the time of MDCT, patients with HALT did not present with symptoms, but simply with a small, although significantly increased, mean transprosthetic gradient. Similarly, Makkar et al 9 found reduced leaflet motion on MDCT in up to 40% of patients treated with differing THV platforms involved in the Portico Re-sheathable Transcatheter Aortic Valve System US IDE Trial (PORTICO IDE) (mean time from TAVR to MDCT, 32 days). They also studied patients undergoing SAVR or TAVR included in the Assessment of Transcatheter and Surgical Aortic Bioprosthetic Valve Thrombosis and its Treatment with Anticoagulation (RESOLVE) and Subclinical Aortic Valve Bioprosthesis Thrombosis Assessed with Four-Dimensional Computed Tomography (SAVORY) registries. In this cohort, a 13% incidence of reduced leaflet motion was observed at a mean follow-up of 3 months. In accordance with our results, anticoagulation with warfarin, as compared with dual antiplatelet therapy, was associated with a much lower rate of reduced leaflet motion (0% vs 55%). Among patients with reduced leaflet motion and available MDCT at follow-up, restoration of leaflet motion was noted in those treated with warfarin but only in 10% of patients who did not receive anticoagulation therapy. Hansson et al 10 recently reported the largest study to date evaluating the occurrence of valve thrombosis post-TAVR as assessed by MDCT and transesophageal echocardiography (TEE).10 Among 405 patients undergoing TAVR with either the SAPIEN XT or SAPIEN 3 THVs, the incidence of valve thrombosis was 7%, and the lack of anticoagulation therapy post-TAVR was the most important factor determining a higher risk of valve thrombosis. Interestingly, THV leaflet thickening and restricted mobility (both signs suggestive of valve thrombosis) disappeared in 85% of patients treated with warfarin. This study failed to show any significant repercussion on valve haemodynamics, although some studies demonstrated a mild increase in transvalvular gradients among patients diagnosed with valve thrombosis.26 This likely reflects an early stage of valve thrombosis post-TAVR, prior to VHD or clinically apparent valve obstruction. In accordance with the results of our study, valve thrombosis as determined by MDCT was not associated with major adverse clinical events, including stroke or cardioembolic events. Of note, no increased risk of CV events (including stroke) was observed within the 2 years following the diagnosis of VHD in our study. Furthermore, additional echocardiographic examinations performed 1 year after the diagnosis of VHD failed to demonstrate a further deterioration in valve haemodynamics, even in the absence of anticoagulation therapy. Studies with a longer follow-up will be needed to determine whether these early subclinical changes in valve haemodynamics ultimately affect valve durability over time. Several limitations of the present study warrant further consideration including its non-randomised design with a retrospective analysis of prospectively collected data. While this was partially compensated by a strict matching process, the results of this observational study need to be confirmed by a larger, prospective randomised trial. The indication of anticoagulation was determined by each participating centre. Only patients who survived 12 months post-TAVR were included in the present analysis; hence, the real incidence of VHD may have been underestimated. Frailty assessment was not systematically performed. Also, data on bleeding events and transient ischaemic attack during follow-up, as well as heart rate and stroke volume at the time of echocardiographic examinations were not available in most patients. Transvalvular gradient assessment was made on the basis of the results of transthoracic echocardiograms analysed and reported by each centre. There was no independent echocardiographic core laboratory analysis involved in this study. TEE or MDCT studies were not systematically performed in patients meeting the criteria of VHD. Finally, following the diagnosis of VHD, the treatment was determined according to the choice of each individual centre, and no standardised protocol had been established. Anticoagulation therapy following TAVR thwarted an early increase in transvalvular bioprosthetic gradients, reducing the risk of VHD within the year following the procedure. The occurrence of VHD post-TAVR did not associate with worsening clinical outcomes after a mean follow-up of about 2 years. Antithrombotic therapy post-TAVR remains an unresolved issue, and multiple ongoing randomised studies are currently evaluating the safety and efficacy of systematic anticoagulation therapy in patients undergoing TAVR. These studies represent a unique opportunity to confirm the efficacy of anticoagulation in preventing the occurrence of VHD following TAVR. The most appropriate antithrombotic regimen following transcatheter aortic valve replacement (TAVR) remains to be established, and concerns have recently emerged regarding subclinical valve thrombosis post-TAVR. The lack of anticoagulation therapy post-TAVR influenced transcatheter valve haemodynamics and was associated with a higher risk of valve haemodynamic deterioration at 1-year follow-up. Valve haemodynamic deterioration did not associate with major adverse clinical events after a mean follow-up period of 2 years. Prospective randomised trials are needed to quantify the impact of valve haemodynamic deterioration on long-term valve durability and to determine if a specific antithrombotic regimen post-TAVR may reduce the risk of incident valve haemodynamic deterioration. The authors want to thank Melanie Côté, MSc, from the Quebec Heart and Lung Institute, for her help in the statistical analysis and the preparation of tables/figures.
. Progression of aortic valve stenosis in adults: a systematic review. J Heart Valve Dis 2012;21:454–62. Contributors Each author has contributed to this work as follows: MDT, PP, JR-C: conception and design, and interpretation of data; drafting and revising of manuscript; final approval of the manuscript submitted. AJM-G, AL, VA, HCW, LN-F, ANC, EG, VS, JK, IJA-S, LMB, FL, AM, HLB, PJ-Q, BGdB, AD, OA-JA and RP: critical review of the manuscript for important intellectual content; final approval of the manuscript submitted. Funding MDT and OA-JA were supported by a research PhD grant from the Fundacion Alfonso Martin Escudero (Spain). JR-C holds the Canadian Research Chair ‘Fondation Famille Jacques Larivière’ for the Development of Structural Heart Disease Interventions. Competing interests PP has Core Lab contracts with Edwards Lifesciences for which he receives no direct compensation. R-C has received research grants from Edwards Lifesciences and Medtronic. Ethics approval The study was performed in accordance with the institutional ethics committees. Is bioprosthetic leaflet thrombosis a trigger to valve degeneration?